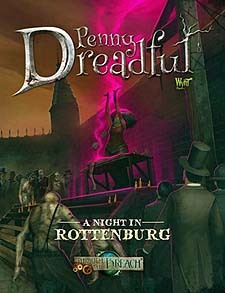 A Night in Rottenburg takes players into the heart of the Quarantine Zone, to the walled community of Rottenburg. There, the air thrums with necromantic energy, and the dead walk the streets alongside the living, serving as their silent protectors amidst the chaos of Malifaux City's forgotten districts. Northern Aggression is a fun four session adventure filled with undead for the Through the Breach roleplaying game. It requires the Fated Almanac to play and is a good companion adventure for the Undead Quarantine expansion.